The Flat Field Geoptik LED generator is compatible with telescopes from 156 mm up to 210 mm. It allows you to record FLAT images in order to correctly calibrate your astronomical images and eliminate artifacts resulting from dust and moisture residues, as well as to correct uneven image lighting such as vignetting. It can be used with both CCD and DSLR reflex camera, the rheostat allows to adjust the light intensity produced by the LED panel. It comes with three fixing screws and a 12V power cable with cigarette plug. Light from heavenly objects in the field of vision. The various types of noise generated by the CCD. Defects in the optical system. CCD dissociation (pixels more or less sensitive to light). Powder on the CCD (seen as donut stains). 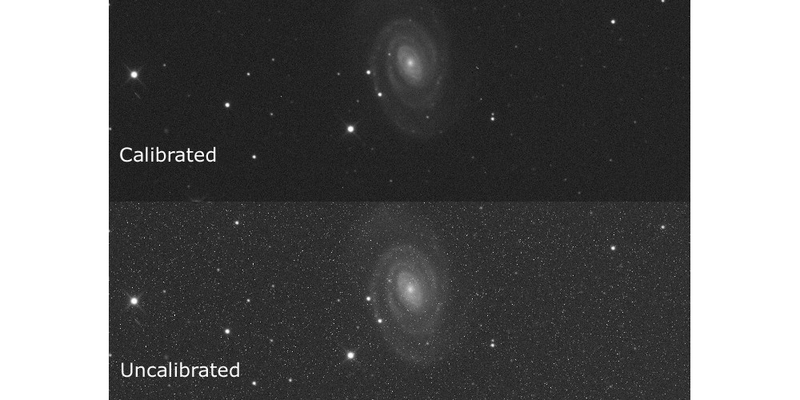 Below you can see the comparison between a calibrated and uncalibrated image.